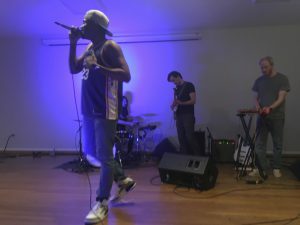 On Friday April 5th, Philly-based hip-hop group Hardwork Movement took the stage in Allison Community Room. 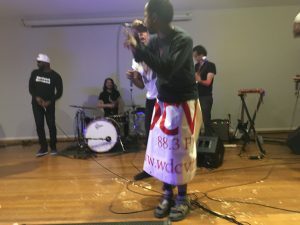 Founded by two Dickinson alumni Dwight Dunston ’10 and Jeremy Keys ’11, this concert was a celebrated homecoming. 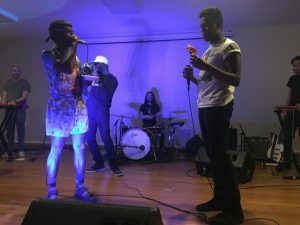 With four rappers, a flutist, pianist, bassist, drummer, and trumpeter, the band’s energy immediately infected the crowd. Audience members leaned against the stage as Keys, Dunston, and the rest of the group bounced and danced through their set. Keys had a specialty for leaning up into the audience, zoning in on listener, and speaking his verses to an individual. When the music would build, the band would crouch with the tension. When the beat finally dropped, they’d all splash around the stage, infectiously dancing and singing. Dunston had multiple costume changes, sporting a denim onesie, socks and sandals, and of course Dickinson merchandise. The crowd’s favorite of course was when he grabbed our over-sized WDCV canvas poster and wrapped it around himself like a cape. Whoever sang the next verse had the honor of wrapping the sign around themselves, all the while grooving with the upbeat music. 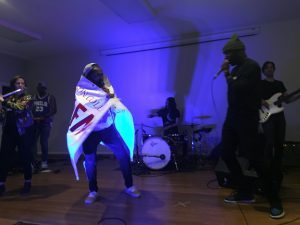 Throughout the one hour set, Hardwork Movement presented the crowd with their best songs, including freestyles in spoken verse and instrumentals. When the set finally wrapped up, every audience member went home with an extra bump in their step. Hardwork Movement brought to Dickinson light and energy, passion and power. WDCV thanks the band for coming through, and the audience members who made it such a fun experience! Find Hardwork Movement on spotify!